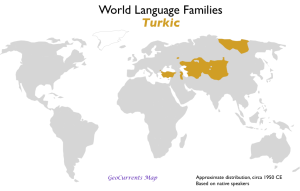 Today’s language-family maps take up the controversial issue of Altaic. 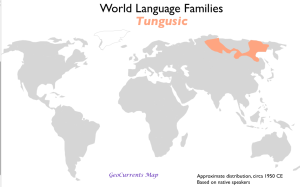 Several decades ago, many linguists grouped the Altaic languages with the Uralic languages, but that thesis is no longer tenable. Now many linguists are expressing doubt about the Altaic family itself. Languages placed within this group have a number of common features, but such features seem to many experts to result from borrowing. The farther back in history one goes, the less similar the main branches of the Altaic family appear. 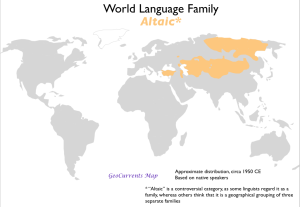 To the extent that this is true, Altaic cannot be regarded as a legitimate language family. I have therefore included a conventional map of Altaic, based closely on the Wikipedia language-family map found here. 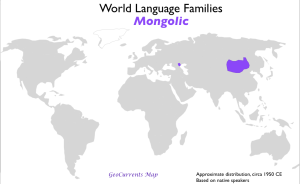 But I have also posted maps of the three main branches of Altaic (Turkic, Mongolic, and Tungusic), which may well be first-order language families themselves. Note again that the mapping is approximate at best, and refers to the situation pertaining in the mid-twentieth century rather than that of today. I have again closely followed the Wikipedia original map, although I did add a small Turkic area in northeastern Bulgaria. I wanted to add one as well in northern Cyprus, but the area is too small to be indicated given the tools that I am using. A few scholars have suggested that Japanese and Korean also fall into the Altaic category, although that view is difficult to support. 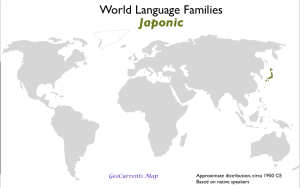 Others think that both languages have an Altaic superstratum,* but do not belong in the family (it has also been suggested that Japanese has an Austronesian substratum). 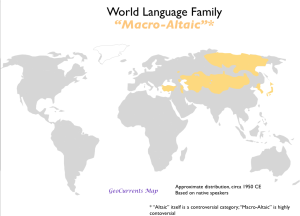 Although the membership of Japanese and Korean in an Altaic family seems highly unlikely, I have posted a map of “Macro-Altaic” that includes both languages just to be comprehensive. The Wikipedia map also classifies Korean as an isolate. 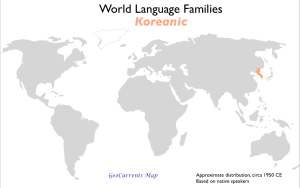 I have instead placed it in the Koreanic family, as several extinct languages also fall into this group, and as the tongue of Jeju island is considered by many linguists to be distinct enough from standard Korean to be classified as a language in its own right. I have thus added a dot for Jeju. It is too large, but unfortunately I cannot shrink it any further. *A “superstratum” refers to linguistic elements imposed on a given language by high-prestige people, often rulers, who spoke a different language, whereas a “substratum” refers to the surviving linguistic elements of a group whose language was supplanted by another tongue.